Kristin Donnelly's all-natural lip balms are inspired by classic cocktails. While enjoying some well-made Martinis, it occurred to foodie-turned-alchemist Kristin Donnelly that mixing cocktails is a lot like blending ingredients to create lip balm. After a year of tinkering, she developed these all-natural, cocktail-themed balms made with organic essential oils, luxurious butters, and golden beeswax. 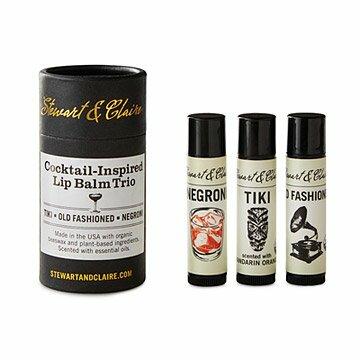 In a market flooded with bubblegummy scents, Kristin wanted something for grown-up tastes, and this trio of Old Fashioned, Tiki, and Negroni lip balms offers a sophisticated alternative. Presented in a tube styled after fine whiskey packaging, the set makes an indulgent treat for yourself or a nifty gift for a cocktail-loving friend. Handmade in Iowa. Ingredients: Beeswax, jojoba, safflower oil, shea butter, castor oil, gentian root, essential oils of sweet orange, bitter orange, juniper, clove and peru balsam. While working as a food editor at Food & Wine, Kristin Donnelly was inspired to create a lip balm using the thought and care she had seen in the artisanal food movement. She knew that, as with any kind of alchemy, it was important to start with great ingredients. In the case of her lip balms, Kristin uses pure essential oils distilled from botanicals, natural butters, and golden beeswax. With her husband, Kristin launched her company in New York City and now operates it from Bucks County, PA. Her balms now have cult-like followings, especially among food and cocktail enthusiasts. I will definitely give this as a gift to others. I bought these as "stocking stuffers" and gave a different one to different cocktail nerds I know. They all liked them and thought they were fun. I kept one myself and like the quality and natural ingredients.